Add some fragrance to your home this winter with our Ziva Paperwhites. These flowers love to be in containers and will bloom indoors and give off the sweet smell of the holiday season. Ziva is a no fuss, fast blooming cultivar. 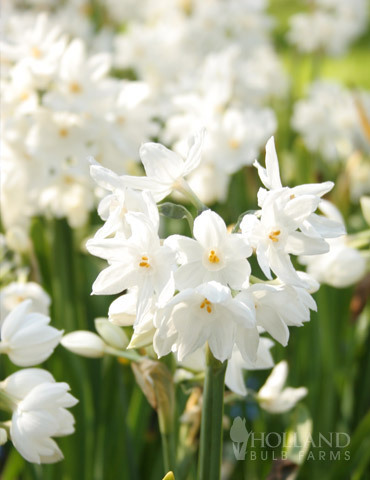 Just add water and wait for the lovely fragrance of Paperwhites to fill your home! Fill the glass with water to just beneath the bulb. The water should not touch the bottom of the bulb. Place the glass in a cool (5-10°C), dark and ventilated spot. When the buds are 5 cm high (after 10-12 weeks) the glass can be placed in full daylight at normal room temperature. Turn the glass occasionally partly, as the flowers will grow towards the light. Easy! Healthy bulbs. Smell wonderful, like spring! Very nice and brought a lovely fragrance to our home. Bulbs look healthy. I am cooling to force and excited to see them grow.